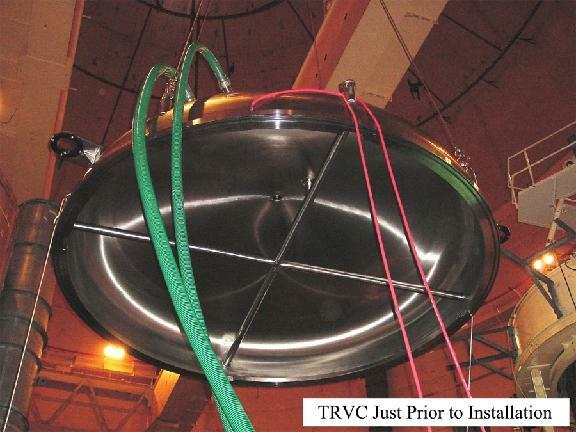 Quality Engineered Products builds temporary reactor vessel covers that allow plants more flexibility during refueling outages. TRVCs can save outage time and allow loop affiliated work without cavity drain-down or the use of loop plugs. All polished stainless steel surfaces for ease of deconning. 4" full suction rated vent hoses with locking cam-lock couplers. Options for either a single vent hose or dual vent/back-fill hoses. Main stainless steel dome is 1/2" minimum thickness. We use dual EPDM rubber seals that need no special tools for installation or removal. Seals snap into a dovetail groove and require no retaining clips of any kind. We use replaceable stainless steel safety hoist rings (4) with a sufficient rated load capacity such that 3 hoist rings can safely carry the TRVC weight. We generally supply an oil free stainless steel cable lift rig for installation and removal of the cover, but all features are flexible depending on the needs of the particular plant's procedural and physical requirements.